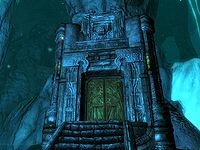 Derelict Pumphouse is a small Dwarven ruin located in Blackreach. The pumphouse is located on an island in the waterfall-fed lake at the south end of Blackreach. to the left of entrance. 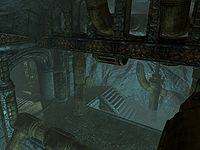 There are two entrances to the Derelict Pumphouse; one near the water's edge, and another via a lift from the walkways high above the lake that lead to Raldbthar Deep Market. Three geode veins are located around the lake the island is in the middle of; one to the east of the lower entrance, the other two are near the bottom of the stairs leading down from the War Quarters to the lake. There are several crimson nirnroots around the lake, with one on the island with the door to the lower entrance. There is one behind a waterfall due south of the island. Another is near the shore by the two geode veins and another is found slightly further up the stairs near a broken pipes that is emitting steam. Further up the stairs to where they split follow the path to the right, take care as there are two Frost Trolls in this area. Finally there is one that can only be reach from the top of the lift--(see notes). Entering from the lower entrance, there is a room guarded by a Dwarven Spider Guardian. Across a bridge over water is a lift which will lead you to Raldbthar Deep Market. On the right are stairs leading down into the water and on the wall an adept locked chest. Under the bridge is a crimson nirnroot and an unlocked chest. To access them you will need to jump over the pipe to the west of the bridge and activate the valve under the water. This lowers the spears on this side under the bridge. A second valve under the bridge lowers the second set of spears and allows you to use the stairs to leave the water. There is a crimson nirnroot that can only be reached from the top of the lift. It is due west, between two waterfalls on top of a large rock. To reach it travel up in the lift, turn to the west and walk to the edge, then use a single word of Whirlwind Sprint. This should allow you to land right in front of the nirnroot. There is also a patch of fly amanita at the same point. Be careful if you over shoot it will probably kill you.